In May of 1989 he made a second - this time bigger - journey to Pomakochoria in Thrace. He was brought by car by a young man he knew and, when they arrived, they took with them two Pomaks who had become Christians and would frequently visit the Elder. After asking for the blessing of the Metropolitan, they began their journey. 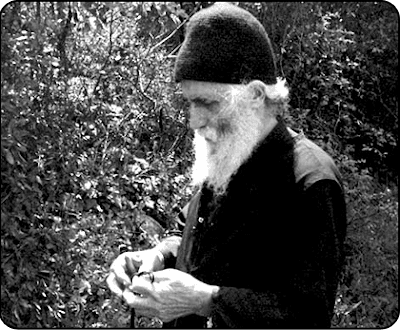 The goodness of Father Paisios "spoke" to the hearts of those simple people. And, because they heard his godfather was a Saint and that in his homeland, in Farasa, he performed many miracles even for Muslims, everyone wanted to see him and invite him to their homes. Those who were from other villages also begged him to visit theirs. In each house he entered all the neighbors gathered - thirty Muslims in one place, fifty Muslims in another - to hear something from his lips. He said something like: "God loves us all. You also are children of God. A Muslim who becomes a Christian can be saved much easier than one who has been a Christian since a child, because the Muslim who does not know anything enters Orthodoxy and learns everything from the beginning, and becomes better. You, if you confess Christ, will be in a better position than us, because we know everything and unfortunately do not apply them." As he walked through the streets of the villages, the people gathered around him, and he looked at them with visceral eyes, handing out sweets to the children and conversing with everyone. "I do not know anything. What should I say in my prayers?" "What do you know to say?" he asked. "I know how to say 'Lord have mercy'," she responded. "Say this continuously," the Saint advised. "Well, well," said the Saint and he entered her house, taking with him a Pomak as his attendant. "Do you want to become well?" he asked. Then he pulled out his wooden Cross and, whispering the prayer, went to touch her on her forehead. She was abruptly shaken and pushed the Saint away with strength. "The tagalaki [demon] is very strong," he said to the Pomak, "we must restrain her." They managed to immobilize her, and the Saint crossed her twice on her forehead. Then the woman fell down and began to yell: "Leave, I don't want you!" From her mouth came foam and an unbearable stench. The Pomak became frightened, but the Saint reassured him: "It is coming out, don't be afraid. Tell her to cast it out." As soon as she said: "Go away, Satan! ", the Saint applied for the third time the Cross on her forehead. Then they saw a demon leave in the form of a black dog and left the woman unconscious. Once recovered, she told them: "I don't have the weight within me that I had, but I'm burning. A fire went through me and burned me." "Tell her to pray for the monk, that God would receive him in a corner of Paradise." "He doesn't want money," said the Pomak to the woman. "Only tell him to have a Good Paradise." "What should I do now? What should I do?" "Read the Gospel," he said, "and do not observe coffee cups, or say the horoscopes. Try to work as much as you can. With work you will break away from these things. If you do not work and do the same things again, the same thing will happen to you." To those who accompanied the Saint, he said: "If she doesn't put the Cross on herself (that is, become baptized), she will not get well." Source: From the book Άγιος Παΐσιος ο Αγιορείτης published by the Holy Monastery of the Evangelist John the Theologian in Souroti. Translated by John Sanidopoulos.